Corrosion is always possible when you work in the oil and gas industry. From natural causes like rain, wind, and dirt, to the resources themselves, this industry has many possible causes of corrosion that can damage many of the components needed to keep your business running. At IXS Coatings, we have made great strides with protective polyurea coatings that can help to slow down or stop corrosion. With our coatings, you will see a reduction in corrosion, abrasion, and leaks. Contact us today to learn more about how we can help your company save money. Our staff is made up of dedicated professionals who understand the unique needs of many different industries. Even with the most strict maintenance, your tanks are constantly being exposed to chemicals and the elements. Over time, these factors will damage your tanks to the point that they start to leak or fail altogether. 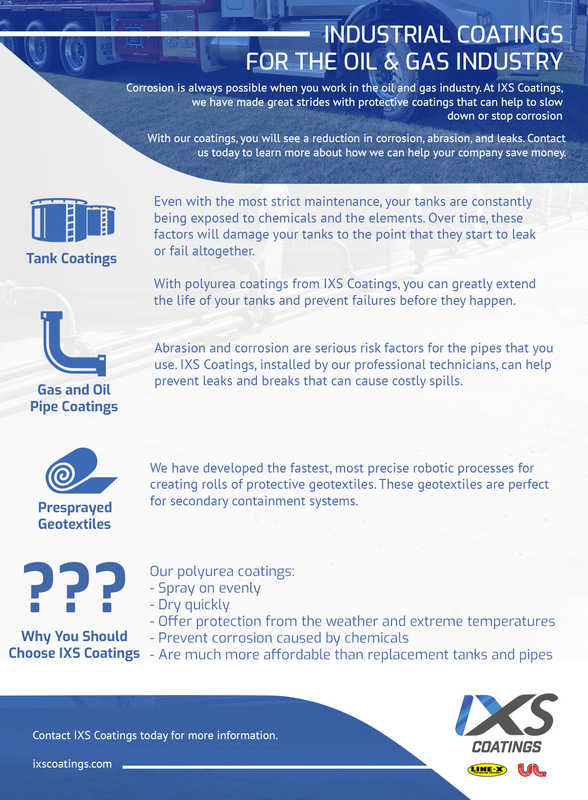 With polyurea coatings from IXS Coatings, you can greatly extend the life of your tanks and prevent failures before they happen. For a small initial investment, you will be able to save a lot of money, time, and frustration. Abrasion and corrosion are serious risk factors for the pipes that you use. IXS Coatings, installed by our professional technicians, can help prevent leaks and breaks that can cause costly spills. We have developed the fastest, most precise robotic processes for creating rolls of protective geotextiles. These geotextiles are perfect for secondary containment systems. In most locales, secondary protection is required by law, so make sure that you are following all local rules and regulations by protecting possible spillover areas. In addition to legal compliance, these geotextiles can help save you money by reducing or eliminating cleanup costs. Spray on evenly. Whether they are applied by one of our staff or through one of our efficient and scalable robotic systems, an even spray is key to keeping your project cost-effective. Dry quickly. Less downtime means less money lost. Offer protection from the weather and extreme temperatures. Our polyurea coatings create a molecular bond that forms a barrier against heat, cold, and moisture. Prevent corrosion caused by chemicals. We have tested our protective coatings in order to ensure that they cannot be damaged by chemicals. Are much more affordable than replacement tanks and pipes. For a fraction of the price of a new tank or new piping, a coating from IXS will keep your equipment in good working order for a long time. Contact IXS Coatings today for more information. Our team is ready to help you find the best ways to protect the gas and oil equipment that you rely on every day. 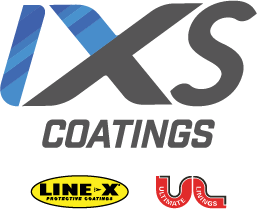 If something needs unbeatable protection from the most-trusted names — LINE-X and Ultimate Linings — contact IXS Coatings now. Our coatings have been used in a wide variety of industries, including the military, automotive, and construction sectors. When you need trusted, proven spray-on protective coatings, IXS Coatings is the only name that you can always count on.